I can’t begin to tell you how difficult it was for me to take these pictures. Not only because I’m a photography novice and I’m all thumbs when it comes to using my husband’s fancy Olympus camera and I’m awkward when it comes to food styling, but because I could not control myself around these cookies! These were the cookies that started it all for me this season. They started me on a serious cookie rampage! Not that I’m complaining though. These little gems are worth obsessing over. They may be flour-free, vegan, and free of refined sugar, but believe me, these peanut butter cookies are just as chewy, buttery, crispy, and melted chocolate-y as their unhealthy counterparts. Yes, Virginia, there IS a Santa Claus! I hope you all had a chance to make some of my healthy natural sweetener the other day. 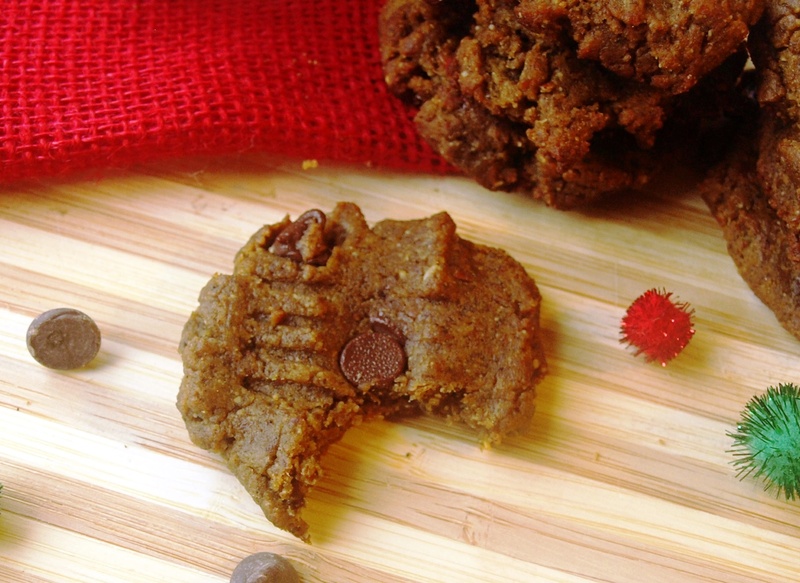 If not, these cookies are the perfect motivation to make your own date paste. I’ve made these several different ways, with varying results. Obviously, I’m sharing my favorite version today, but I do have some ideas for variations following the recipe. 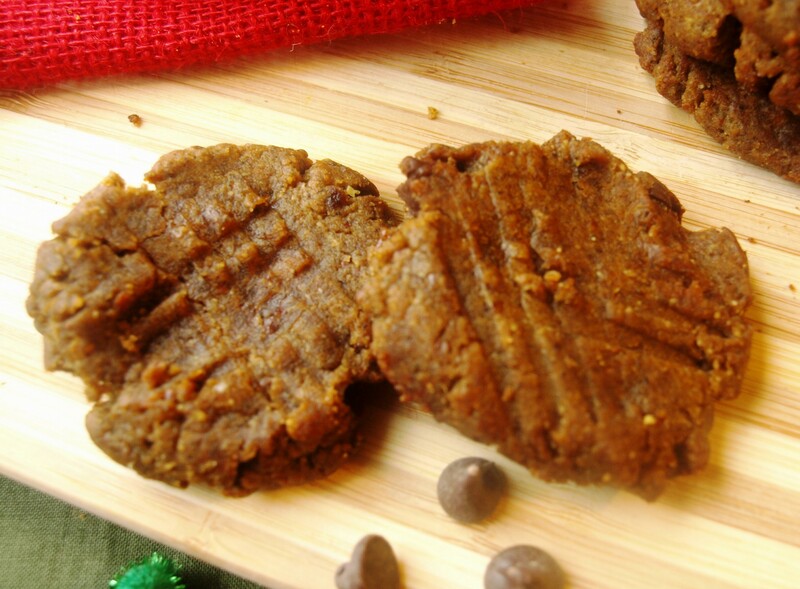 The secret healthy ingredient that produced the best cookie, according to my taste-testers, was…. You’ll never guess. Really. You’ll never believe me. It was… hemp protein powder! That’s right. It produced the best texture, and even enhanced the peanut-y flavor, without a hint of hempy-ness at all. Hemp protein powder is hands-down my favorite kind of protein powder to use. I often use it in my smoothies, or I blend it with banana, cocoa, and almond milk for an awesome chocolate protein shake. Hemp protein powder is great because it is an easily digestible and complete protein source (it contains all 9 essential amino acids) with about 13-15 grams of protein per serving. It boasts high amounts of omega-3 and omega-6 fatty acids, at a desirable ratio. It is also a great source of iron, magnesium, and fiber. It offers all that, without a discernible taste or grittiness that I’ve found with other protein powders. I recently came across an article on One Green Planet suggesting new ways to use hemp protein powder, and I was intrigued by their suggestion to use it in baked goods. In the middle of my cookie experiments, I opened the door to the freezer (where I keep my container of Nature’s Way Organic Hemp Protein Powder) and thought, hmmm. I looked at my bowl of soon-to-be cookie dough, back at the hemp powder, and back at the mixing bowl. Yesssss…. eeeeexceeelllent idea! (insert Mr. Burns-style finger twiddling and maniacal laugh here) If you add in the protein from the peanut butter, as well as a small amount from the date paste, we’re talking about some pretty substantial protein power packed into one delicious cookie (I estimate about 6 grams per small cookie). Not. Too. Shabby. Evidence that I could not, indeed, control myself. This recipe can still be made without the hemp protein powder, if you do not happen to have any. However, if you’re looking for a healthy protein powder, you may want to give it a try. 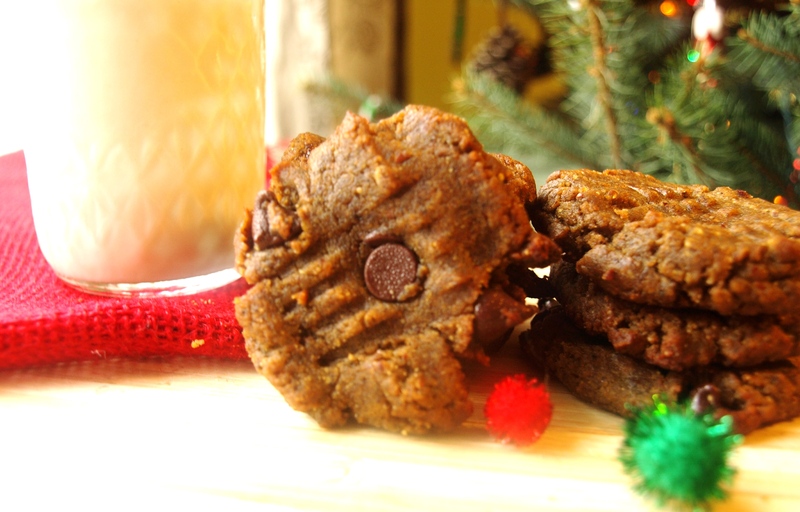 These cookies definitely need to be on your list of treats to make this holiday season. Enjoy! 1. Preheat oven to 350 degrees. Line a cookie sheet with parchment paper. Mix all ingredients except chocolate chips in a large mixing bowl. Mix, mix, mix, until the dough becomes less runny and more firm/harder to stir. Or you can mix everything in a food processor. Fold in the chocolate chips. 2. Drop heaping tablespoons of dough onto the prepared cookie sheet. Use your hand to flatten or use a fork. If the fork is sticking, try dipping it in coconut sugar before flattening. Bake for 10-12 minutes, or until lightly golden brown. They will still be very soft out of the oven. Let the cookies sit on the pan for 5 minutes then carefully move to a cooling rack to cool completely. 3. I like to pop these in the fridge (or freezer) and enjoy them best cold! I think the best taste and texture is achieved after they’ve cooled or are cold from the fridge. 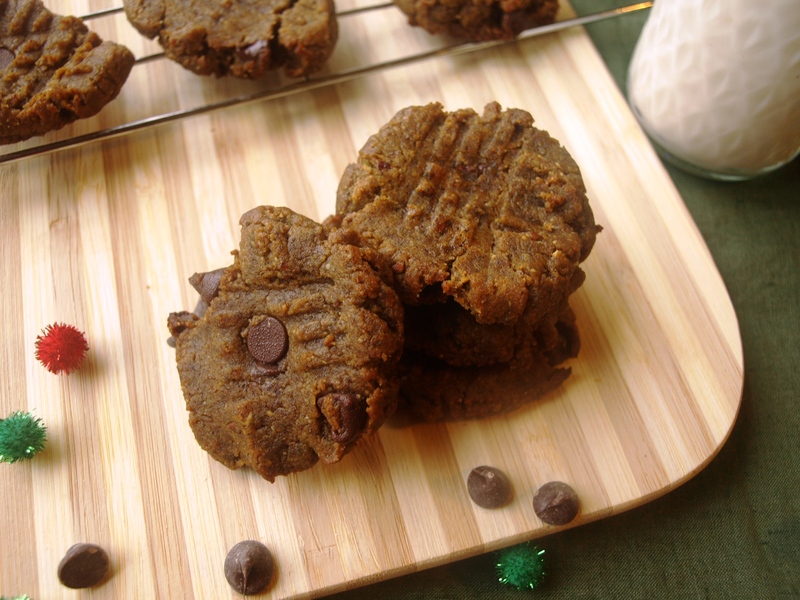 I was making these for a while without the hemp protein powder and they are still excellent! Just use slightly less date paste, i.e. a scant 1/2 cup versus a heaping half cup, and increase the flax seeds to one tablespoon. If the dough still seems to runny/sticky to work with after stirring it vigorously, try putting the dough in the fridge or freezer for 10 minutes or so before scooping out. Hi-ya Sweetie! Meet Your New Favorite Natural Sweetener, Homemade Date Paste!